Boston Wine Expo 2012 Ticket Giveaway! Poll: How much do you tip for wine service? Dan from Franklin gave Massachusetts wine enthusiasts a nice little Christmas gift by giving Governor Deval Patrick an opportunity to publicly proclaim his support for direct wine shipments on a radio call-in show Thursday. During an interview on 96.9 Boston Talks, Patrick said "I would sign that bill if it came" in response to a question about why direct wine shipments haven't become a reality even after appeals were exhausted in early 2010. The bill he was referring to is House Bill 1029 which was introduced in 2011 but never made it out of committee. The state legislature operates on a 2-year session however so perhaps this publicity is just the nudge needed to force some action on this important-but-non-urgent issue. At around 35:00 minutes remaining in the audio archive (it's pretty entertaining - I'd recommend giving it a listen when you have a chance) Patrick said "Dan, you're killing me here" when asked why shipments still couldn't happen - as if to say he too has been annoyed that he couldn't ship home wine when visiting California and New York. Patrick then went on to describe his familiarity with the issue saying he understands the concerns of state retailers and wholesalers as well as concerns about underage access. For Patrick to sign the bill, it needs to be voted out of the Committee on Consumer Protection and Professional License, and passed by the legislature - which will hopefully happen in 2012. There's an excellent text summary of the situation by Kyle Cheney of the State House News Service posted on The Boston Herald's website. Thanks to Gary Curtis (@wineblogman on Twitter) for the heads up. And thanks to Dan from Franklin for raising the awareness of this issue in such an effective way. If you haven't already, now would be a good time to ping your state representative asking them where they stand on this issue and encourage them to support the bill. Don't know who your legislators are? Use this website to find out. Hope you all have a safe, healthy, and very happy holiday season! There's been quite a run of these vouchers lately. What more can I say about them? The value of the voucher can't be applied to shipping, and unless you're part of their Steward Ship program the cost of shipping first bottle can be quite costly (around $12.95). And don't get any funny ideas about stacking the voucher with deals like site-wide $0.01 shipping - the voucher can't be combined with other promotions. Some of their prices can be quite high. But if you're disciplined, catch Steward Ship when they offer it for $25, and have patience - you may be able to find some pretty good deals. Sometimes. 28 people entered our drawing for a pair of tickets to the 2012 Boston Wine Expo - 25 via comments on this blog post and 3 more via email. I assigned the comments numbers 1 through 25 with the number 1 going to the first comment. Entries 25 through 28 were assigned to the email entries. ...so the winner is Glen! I'll reach out via email and connect him with the folks from the Expo to get him his tickets. Congratulations! Enjoy. Thanks for the participation everyone. For more information and to purchase tickets to the Expo visit their website. As is being discussed in the Smoking Deals at Wine Retailers thread on the CellarTracker Forums, JJ Buckley Fine Wines is offering $50 gift cards for $25 - limit 3 per person. You can give these as gifts (via email or USPS), use them to buy gifts, or use them to buy wine for yourself. Stack it with $1 Ground Shipping on new orders through the end of December 2011 and this might be the best wine deal of 2011. They've got good pricing on their website but the best deals come through Preferred Customer Pricing offers delivered via email. Place an order with them to be included on these offers -or- drop me an email if you'd like a referral. Once you're on their list you're assigned a salesperson you can email with parameters of what you're looking for. They'll scour their inventory and come up with a list of wines that meet your parameters. Regardless of how you choose to order, you can build up to a straight case over time (to minimize per-bottle shipping costs) and then ship your order when weather conditions are optimal. Like all out of state retailers, they unfortunately can't ship to Massachusetts. Disclosure: JJ Buckley ran an ad on the WWP the past few months which this post isn't related to. Thanks to friend and reader SB for the heads up! Question of the Day: What do you see in-stock at JJB right now that you'd recommend? Thanks to everyone who entered! This contest is now closed. The nice folks at the Boston Wine Expo have given me 2 tickets for the 2012 Boston Wine Expo to give away. The tickets are for the Grand Tasting Sunday January 22nd 2012 from 1pm - 5pm at the Seaport World Trade Center - a $150 value. Check out these options if you're in the trade, a potential exhibitor, or the media. To enter the contest all you have to do is leave a comment on this blog post (http://www.wellesleywinepress.com/2011/12/boston-wine-expo-2012-ticket-giveaway.html if you're reading this via email or a feed reader). Winner will be randomly chosen. Deadline to enter is 11:59 pm Thursday December 15th. Tickets are on sale now for the 2012 Boston Wine Expo. 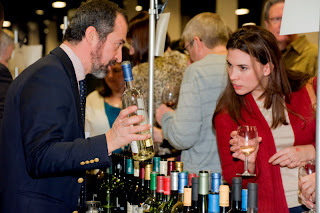 This year's Grand Tastings are held at The Seaport World Trade Center January 21-22, 2012. These prices appear to be 15-20% lower than last year. For example, the early bird Sunday ticket price was $85 last year. 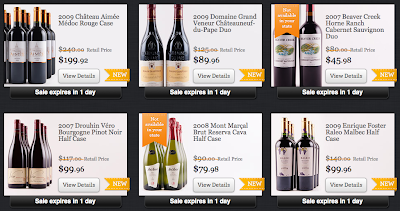 Wakefield, MA based daily deal site Eversave is offering $35 for $70 at Wine.com. See - I told you Wine.com was making the rounds with these deals. 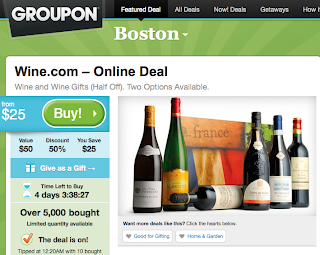 Like other Wine.com social coupons, the voucher value can't be applied towards shipping or tax, can't be combined with other offers, and is said to be invalid for shipping alcohol to MA. I've bought from Eversave in the past without incident. They're not as famous as Groupon and LivingSocial - but they're legit. Deal expires Thursday, December 15th. Promotional value of voucher needs to be used by March 5th, 2012. Good news for Massachusetts wine deal hounds - national flash sale retailer Lot 18 is saying they can now ship to Massachusetts. Those of you familiar with Massachusetts wine shipping laws will rightly wonder - how can this be? It looks like most (but not all) of the imported wines are available for shipment to Massachusetts and hardly any of the domestic wines are available. What's going on? It appears they've established a relationship with a Massachusetts retailer which will fulfill orders in Massachusetts for wines that are distributed here. A few weeks back I took advantage of a Chateauneuf-du-Pape offer which was fulfilled by Corporate Wines in Woburn. Corporate Wines has a reputation for fulfilling straight case orders at aggressively low prices - but with a spotty fulfillment track record. Since they often sell from virtual inventory they can't always get the wine. Separately from this, we sometimes see a domestic winery claiming to be able to ship to Massachusetts. A few wineries do indeed have the ability to ship to Massachusetts - but they typically need to ship via carriers other than FedEx or UPS if they're doing it on the up and up due to remaining legislation that needs resolution in order to establish reasonable guidelines for domestic winery to consumer deliveries in Massachusetts. Here's a brief history of Massachusetts wine shipping laws if you're interested. Roll this all together and I can't see how this is bad for Massachusetts wine enthusiasts. Another channel to purchase through. If you can get past the occasionally far-reaching email offers, Lot 18 can be a decent place to purchase wine from. Or refer a friend if you're already on to them. Question of the Day: What do you think of Lot 18? PS They're running an offer on the WWP blind tasting favorite Soiree wine aerator with premium travel-friendly packaging for $10 less than Amazon. 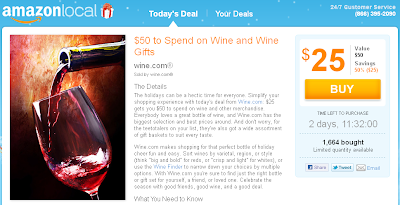 Groupon is offering 50% off at online retailer Wine.com. They say the offer runs through Friday but quantities are limited and we've seen these sell out in the past. 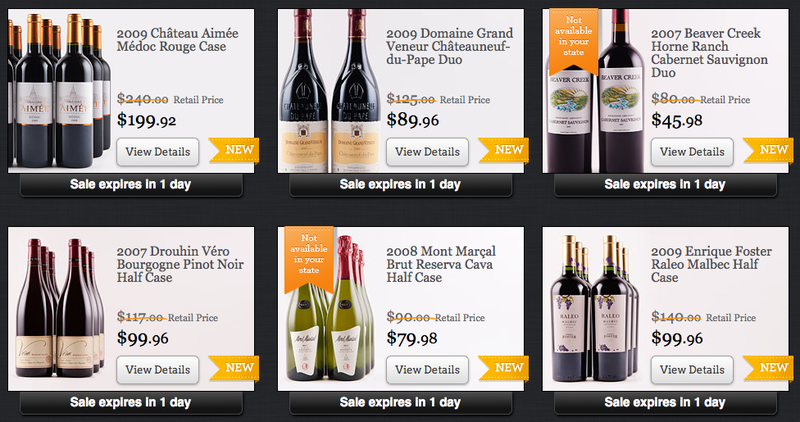 After a wave of similar offers earlier in the year, Wine.com seems to be making the rounds again with these offers. Living Social ran a $40 for $80 a couple weeks ago. This time it's $25 for $50 -or- $40 for $80 through Groupon. I'd recommend going for the $40 for $80 because the voucher can't be used towards shipping and as a percentage of the total order less value is eroded with the $40 for $80. If you've previously purchased their Steward Ship package (similar to Amazon Prime - free shipping on all orders for a year) it can be used in conjunction with vouchers like this one. They sometimes offer that for $25 and include a 6 month subscription to Wine Spectator so there is a certain amount of stacking that can be done here. But you have to be crafty. One other catch - they say it doesn't work for alcohol orders shipped to MA. If you can get past that, you'll notice the prices at Wine.com aren't exactly the greatest. But their markup doesn't seem to be uniform. Take for example the 2009 Caymus Special Selection. They've got it for $99. With a $40 voucher it would be $60 plus shipping for that bottle which is a about $40 less than I see it for anywhere else in the country. 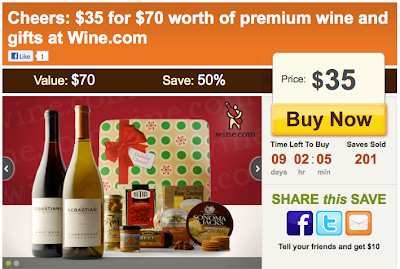 Question of the Day: Any angles you've found to get the maximum value out of these Wine.com social coupons? Some interesting news on the Massachusetts wine legislation front: It looks like a bill and threatened ballot initiative to bump the number of retail alcohol licenses a corporation can hold from 3 to 20 has been withdrawn in favor of a compromise that would gradually increase the limit over the next decade. People are often confused why some grocery stores in Massachusetts sell wine while others do not. It's complicated. Some towns don't allow alcohol sales at all so that explains some of it. But beyond that, current laws permit a maximum of 3 liquor licenses per corporation in the state. This explains why big retailers like Costco, Whole Foods, and Trader Joe's only sell wine at 3 of their locations. My first thought upon hearing the news was: Which grocery stores are most interested in expanding liquor sales? Ironically perhaps, natural and organic grocer Whole Foods was one of the first that came to mind. When they chose to sell alcohol at their recently opened flagship store in Dedham they had to relinquish their license in Wayland. It wouldn't be surprising at all if they brought alcohol back to the Wayland location. Or perhaps their Fresh Pond (Cambridge) and Derby Street (Hingham) locations are even more desirable for the first wave? The challenge any grocer (or retailer) will face is that this change won't increase the number of licenses available at the state or local level. In Massachusetts, licensing decisions are largely delegated to the city/town level and is determined by population. As a result many towns have doled out all of their licenses and in order for a new grocer to pick up a license they'd need to demonstrate the need for an additional license -or- buy one from an existing licensee. One of the things you'll notice if you visit a place like Massachusetts is the current laws have created a situation where liquor stores are placed conspicuously alongside grocery stores. What changes would this change bring about over the next ten years? It's hard to say. On one hand, you've got to believe stores like Whole Foods, Trader Joe's, Costco and conventional grocery stores would love to sell alcohol at all their locations. But at the same time many of these have liquor stores right next to them and they'd have to convince each town there's a need for an additional license and that the nearby retailer isn't meeting the demand. That's going to be a hard sell in the most desirable towns where licenses are already sold out. And what about those retailers? Doesn't this give them an opportunity to expand and meet the demand as well? When I think of big retailers in the state that aren't grocery stores, I think of local operations like Kappy's, Blanchard's, and Gordon's, many of which are already near, at, or above the 3 license limit (thanks to existing stores being grandfather in before the 3-store limit was in place). They're a formidable presence in the area but it's hard to imagine this change benefiting their model substantially. They're already able to purchase in adequate quantities to achieve maximum discounts from wholesalers - what leverage would opening additional stores give them? Not much as far as I can see. The retailers this change would most benefit? The big guys with a track record of success in other markets: retailers like Costco, Total Wine (not here yet but Wine Nation is), and Wegman's (just arriving and eyeing to expand). The only question I'd have is whether they can stomach the other restrictions in place in Massachusetts which limit their ability to drive prices low and control a sufficient portion of importing business for private label wines. This is an interesting change. On the plus side this creates more competition at the retail level which could be good for consumers. On the minus side, good independent retailers who currently make some of their money selling commodity wines may suffer. I'm thinking I like the California model: Make wine available everywhere and let specialty retailers differentiate on selection, service, and business model. With fine retailers like K&L, The Jug Shop, JJ Buckley (WWP Advertiser), BP Wine, and The San Diego Wine Company (to name a random few off the top of my head) doing well alongside stiff competition from Costco, BevMo, Whole Foods, Trader Joe's and virtually every grocery store and drugstore in the state, it's hard to imagine this change being a bad thing for wine enthusiasts. I think boutique stores like The Wine Bottega, The Urban Grape, and VinoDivino will do fine with these changes because they differentiate on service and selection. Discounters like The Wine ConneXtion, Bin Ends Wine and The Wine Cellar of Stoneham will continue to differentiate with their unique assortment of wines at rock bottom prices. Fine wine guys like The Hingham Wine Merchant, The Spirit Shoppe (WWP Advertiser) and Vintages will do fine too because people trust their editorial selection. All of these retailers have business models people like. The retailers that might suffer from a change like this? The run down Massachusetts package store. You know the type: The few windows letting light in are covered with tacky signs. You're greeted by the stench of stale beer coming from the bottle deposit machines located near the entrance (why do we still do that?). Half the fluorescent lights are burnt out while the other half are buzzing. The wine assortment looks like it was done completely by one or two distributors. They only interact with you when asking you to move out of the way so they can restock the dusty shelves. As you make your way towards the register WEEI crackles on the radio and you're met with a dazzling display of impulse buys: Nips, smokes and scratch lottery tickets. Would you rather go to a place like this to buy your wine and beer or pick it up while you're grocery shopping? I think the answer is obvious and that's why run down liquor stores could be threatened by this change. But it's also the type of store most likely to benefit from selling their license to a large chain at a premium. Every liquor license in the state suddenly becomes more valuable. I'd like to see other changes along with this. Let's open up the state for direct shipment from out of state wineries and retailers. Everyone in the Commonwealth would benefit from improved access and increased excise tax revenue from incoming shipments. Massachusetts House Bill 1029 would finally permit out of state wineries to ship to Massachusetts. I haven't heard a peep about it since attending hearings on it and other alcohol-related bills last May. Let's push that through so we can work next year on out of state retailer shipment. Let's allow Massachusetts retailers to ship out of state. This would provide innovative retailers leverage to tell their stories and sell their wines to a broader audience without increasing overhead. Massachusetts is the only state I know of that disallows their retailers from shipping out of state. Massachusetts House Bill 1030 would change this - its passage is long overdue. And let's open up competition at the wholesaler level. Massachusetts wholesalers sell some wines to Massachusetts retailers for more than consumers in other states can buy them from retailers. That's got to change to give retailers here a fighting chance to compete at the national level. Drinking moderately and responsibly makes certain that you will not need alcohol abuse rehab in the near future. Question of the Day: What do you think about these changes? More competition is better for the consumer? Or are specialty wine retailers going to be hurt by these changes and that's a bad thing for consumers? A friend and I were talking about this - I thought I'd put it up here for discussion and a poll. You and a friend are out at a restaurant. Let's say it's just a regular restuarant - not a wine bar. You order $100 worth of food and a $100 bottle of wine. The service is good. Solid. How much do you tip? Specifically - do you tip differently for wine service than food service in a restuarant? Does it depend on the quality of the wine service? If they pour your $100 prize into cheap little water glasses on the table vs. presenting large clean high quality stemware does it make a difference? How about if it's BYOB? You bring the wine and to justify the (say) $25 corkage fee you bring a really nice one. $100 retail. It would be $250+ if it were on the wine list at the restaurant. Do you pay more for someone to pour your own expensive wine than if it was a $10 bottle? Tell us what you think. Answer the poll below and if you'd like to describe why leave a comment below. Value Alert: 2007 Betts & Scholl Grenache "The O.G"
Editor's Note: I blog less frequently when I'm not in the best of moods, hence the quiet period here the last couple weeks. Steve Jobs' passing last week was, I think, the closest thing to Walt Disney dying this generation is going to experience. I teared up a little when I told my 6 year old. What impressed me most about Jobs was his ability to innovate in so many domains and across so many unique products. His ability to give people a sense of childlike wonder made people feel like with technology - anything is possible. Rest in peace, Steve. You are and will be missed. Ever since I tasted this wine at the 2011 Wine Spectator Grand Tour in Boston (review) I've had an eye out for it. 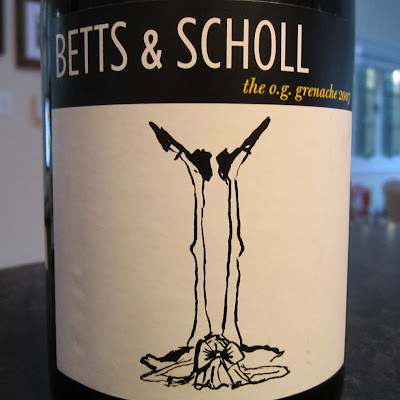 After tasting through some amazing but drying wines at the event from Bordeaux and Barolo, Mike O'Connell Jr from Upper Falls Liquors suggested I check out the 2006 Betts & Scholl "The O.G." Grenache. His recommendation was on the money. I know what you're thinking...a $29 "value" from Australia? Why spend more than $10 in the region for a 90 point wine? Right? There are so many ultra-ripe fruit bombs and otherwise high priced stewy disasters coming out of the region - it makes me hesitant to plop down more than $15/btl. However, this wine breaks the mold for what I've come to know of Australian wine, which has been mostly Shiraz. Betts & Scholl is a unique producer. I wasn't aware until doing some research that they're not necessarily Australian producers. They're a partnership between US-based Master Sommelier Richard Betts and collector Dennis Scholl. Betts described their 2001 bottling as a "warm climate analogy of Pinot Noir" on Wine Library TV in 2007. I totally get that. In addition to Australia, they produce other red and white wines from California and France ranging from $29-$79. The O.G. stands for "Original Grenche" (I was thinking Original Gangster) but they also make a $49 Australian Grenche called "The Cronique". If you get the sense these guys listened to a lot of rap music in the early 90s you might be right. Word has it they named it The Cronique because it was hard to stop drinking and Andre Young (Dr. Dre) was one of the first customers to pick up a case. Interesting stuff. As light as a domestic Pinot Noir visually, but it packs a flavorful punch. Raspberries and strawberries atop vegetal notes aromatically. Surprisingly dense on the palate given its visual transparency. Flavors of sweet spice (cinnamon? ), black cherries, and just a touch of heat (14.5% alcohol). Quite luscious. I like it. I really like it. Purchased at The Urban Grape in Chestnut Hill, MA. Wine Spectator's New York Wine Experience is coming to the New York Marriott Marquis in New York City Thursday October 20th through Saturday October 22nd. The event includes grand tastings similar to those I wrote about back in May as part of the Boston Grand Tour event. The New York Wine Experience also includes moderated sit down seminars and a grand award banquet. Total cost for the full experience: $1,875. But don't let sticker shock scare you away - there are more affordable options. The award banquet costs $400 a la carte. 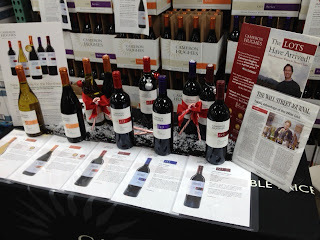 The value play, I think, is the $250 grand tastings which run Thursday and Friday from 7:30 pm to 10:00 pm. $250 for a wine tasting might sound like a lot. And it is. But if you're looking to try some of the best wines produced in the world today in an efficient and indulgent manner, tastings like this are a great way to go. Perhaps even more amazing is the wineries pouring I didn't include. Folks like Beaux Freres, Caymus, Siduri, and Loring. If it's like the Boston tasting each producer is only pouring a single wine - and it's their best. Better yet in many cases it's the winemakers themselves pouring the wines. Have a look at my write-up from the Boston Grand Tour event to get a feel for what's in store. For more information visit the 2011 New York Wine Experience website. I didn't set out to taste through so many 2009 California Pinot Noirs. Rather, it happened naturally as I enjoyed so many of the early bottles I tried and continued as I explored bottlings from new and familiar producers. At some points it felt like I couldn't miss with this vintage. In the $40-$60 range there are some amazing wines available. But there are also some tremendous values in the $20-$30 range, and even south of $20 if you look hard enough. I probably exerted equal effort tracking down and trying 2008 Oregon Pinot Noirs, but you haven't seen a post from me on that vintage. If I did write about it, the headline would probably be "Whatever happened to 2008 Oregon Pinot Noir?" For me, it's been an eye-opening experience that solidifies California as a more reliable place to buy Pinot Noir. But that's just my palate talking. There are some great Pinots produced in both regions and I'll look forward to continuing the search. Have a look at the ratings below and click through to read community tasting notes on CellarTracker. To find them at a retailer near you, click the Wine-Searcher link on CellarTracker. And feel free to drop me an email at wellesleywinepress@gmail.com if you think I might be of assistance tracking these down. Drank this bottle with great friends after an afternoon of golf. A really beautiful wine but I didn't geek out and analyze it so no formal tasting notes. Fresh and lively with a real sense of place. You can taste the Russian River Valley in this wine. On the nose I get fresh cut strawberries and hints of a moderate oak regiment that reveals itself as a friendly Vanilla Coke sort of thing. Really nice. On the palate, it charms with generous fruit and signature Pinot Noir herbaceousness. Long finish. Dark in color, almost Cab-like. Cherry candy fruit on the nose along with tobacco leaf that emerges with some air. Rich mouth feel. May dominate food but on its own it's a beauty. I read a lot of tasting notes saying how a wine really opened up after an hour our two. You're about to read another one of those. I bought quite a bit of this wine so when I first opened it I was a little disappointed. It was a little tight, tart, and awkward. But after sipping on it over the course of an evening it really developed beautifully. The aromas and flavors get darker and and richer over time. Some slightly silty tannins in the background. All in all I think it's great now and all indications are it would improve from just a little bottle age. Nothing crazy - just a year or two. If you want to drink it now, I'd recommend trying a sip, decanting or aerating, or saving a good portion of the bottle for the next night. After an ever-so-slight step backwards in 2008, I think this 2009 Annabella is back on track as a solid 90 point Pinot Noir. Combine that with its wide availability in the $12 range and I think this deserves a slot in the rotation of anyone who likes fruit-forward domestic Pinot Noir. Medium-dark in color and ready to go immediately upon opening. 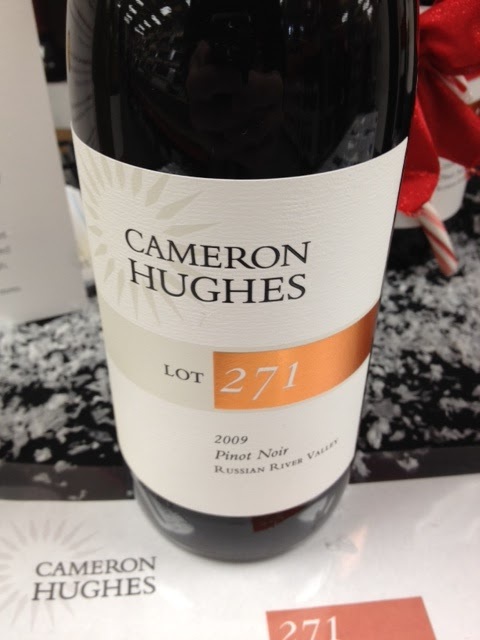 Aromas of pomegranates, cranberries, dark cherries, and dusty fresh blackberries in a briar patch. The initial attack is straight fruit. Silky tannins and it finishes clean with a hint of earth and slight tartness which balances out its otherwise fruity nature. This wine is money and if you don't like it your opinion is false. Just kidding, but kind of not kidding. I drink Pinot Noir more than any other variety and I'm convinced this wine would fool a lot of people blind, hanging with $30-$50 Pinot Noir. Noticeably better than the 08. On par with the 07. My bottle lists the ABV at 13.8%. It's only 20-30% opaque which bodes well for it behaving like a Pinot Noir. On the nose I get ample fruit, herbal tea, and a tangy (signature?) California Pinot Noir note. On the palate it's classic domestic Pinot Noir with strawberry flavors, silky smooth texture, and hardly any tannic bite. Doesn't get overly fruity but it's satisfyingly flavorful. Bottom line: This is legit Pinot Noir for $9.99. The only thing lacking is acidity and perhaps some minerality. But it scores points for what it *doesn't* have: I didn't detect any off-putting aromas or flavors. Okay, I hope you enjoyed 2009 California Pinot Noir week here on the WWP. Next up: 2009 Chateauneuf-du-Pape! Are they as good as the 2007s? Subscribe to the WWP so we can continue the conversation. 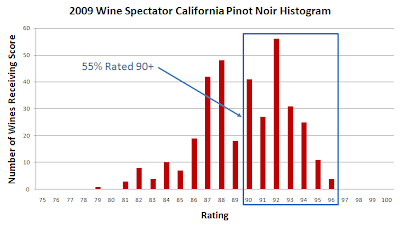 In my prior post about Wine Spectator's 2009 California Pinot Noir ratings I mentioned I'd be talking more about the best values under $30. 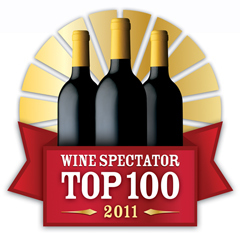 I'll get into that in today's post, but before going further I'd like to encourage you to subscribe to Wine Spectator. I truly enjoyed reading through this Pinot Noir issue in particular. There's something unmatchable about taking a break from staring at the computer monitor and thumbing through glossy pages while enjoying a glass of wine. The issues arrive with higher frequency this time of year, covering the most interesting categories for the upcoming holiday buying season, so it's a great time to subscribe. You can even use airline miles (here's how) and once you have a print subscription you can get an online subscription for 50% off. I constantly refer to their ratings database. 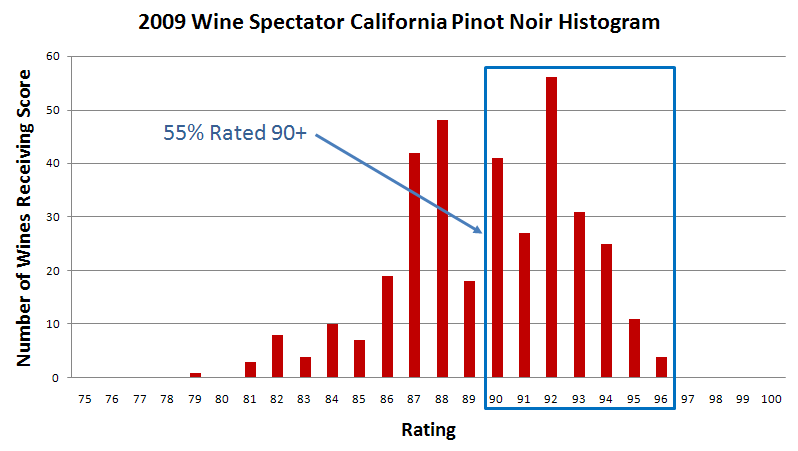 Not just for the scores but for production levels, prices, and historical rating trends for a given winery. But the thing I like best about the magazine is how it turns me on to new producers. I touched on Loring and Siduri in my prior post. I consider them to be cornerstones of value in California Pinot Noir and once we get past them we see a few names that might not be as familiar. First - Chasseur. 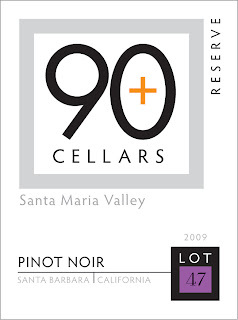 Their $30, 92 point 2009 Sonoma County Pinot Noir is one to seek out. I've tried two bottles of the wine and each time I've been impressed (91-92 points). The CellarTracker median for this wine is currently 90.5. They produced 562 cases of the 2009 Sonoma County and distribute to the east coast so there is still an opportunity to buy this wine at retail. I bought mine at Grapes the Wine Co in White Plains, NY (review of the store here - I think he still has some). Consult Wine-Searcher for retailers with availability near you. The next producer is new to me - Alta Maria. They've got a tasting room in Los Olivos and although they've submitted wines to Spectator for review previously none have been rated 90 or better. 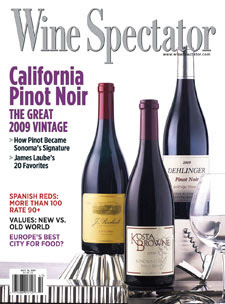 Spectator rated their 2009 Santa Maria Valley Pinot Noir 91 points and The Wine Advocate's Antonio Galloni rated it 92 points so there's multiple critics praising this vintage for them. The CellarTracker median is currently 89.5 and with 1,660 cases produced we see some availability across the country at retail with prices as low as $22.94. Might be a good mailing list to get on as well. Laguna Ridge is a second label from Lynmar who produces Pinot Noir and Chardonnay from (mostly) the Russian River Valley in Sonoma. Lynmar's Pinots range in price between $40 and $120 and Spectator rated their 2009s between 88 and 94 points. 492 cases of the 2009 Laguna Ridge Sonoma Coast Pinot Noir were produced. No CellarTracker ratings yet. Scarce availability at retail so far. Sarapo resells small lots of wine from artisan wineries. It's run by Eric Kent's winemakers and deals mostly in the grape varieties Eric Kent is known for: Chardonnay, Pinot Noir and Syrah. The 89 point 2009 Sarapo Pinot Noir Carneros-Sonoma County Donato can be found at retail for $19.99 and eligible for mixed case discounts which would bring it down to $16.99 or so. One to consider on the more affordable end of the spectrum. There's even some availability in Massachusetts. While there are a few new names to discover here, we haven't seen any mindbending QPRs revealed - at least not yet. It's been mostly a "get what you pay for" vintage as notable for the highly regarded producers who were snubbed (more on that another time perhaps) as it was for the reliable producers who delivered great wines in a great vintage. That doesn't mean it's a bad vintage to buy from - far from it. It just means that for the most part we'll have to pay $25 and up to get an outstanding bottle of California Pinot Noir. But that doesn't mean there's not a few gems out there Spectator didn't rate. Or that we just don't agree on. 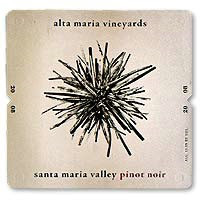 Check back later this week and I'll share my tasting notes for the 25+ 2009 California Pinot Noirs I've tried so far. I think there'll be some gems in there worth discovering. Question of the Day: What are some of your favorite affordable California Pinot Noir producers?